Saffron is a pungent red-coloured spice used for its flavour, aroma and colour. The trade of saffron has extended far and wide across the globe for thousands of years. As a spice, the colour, taste and aroma of saffron make it an essential ingredient for particular dishes of Mediterranean and Asian cuisine, and there are also traditional baked foods from England, Scandinavia and Balkan countries that call for its use. Saffron is receiving renewed interest, worldwide, for its medicinal properties. The saffron crocus (Crocus sativus) belongs to the Iridaceae family of flowers, which also includes irises, and it is a close relative of freesias and gladioli. The saffron crocus is a perennial plant that grows from a rounded bulb (or corm). Purple flowers appear in autumn and erect grass-like leaves emerge just before, with or after the flowers. The saffron spice is the stigma of the flowers (the red filaments or style, that form the female reproductive parts) of the Crocus. At harvest, the whole flower is removed from the plant and later, the stigma is separated from the flower and dried. 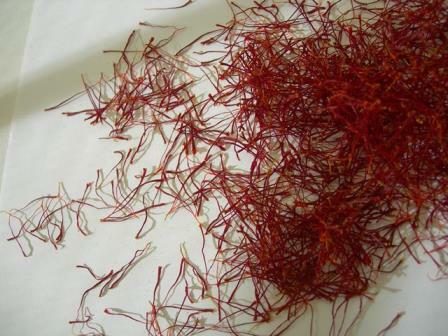 Saffron is generally traded as whole filaments so the consumer can see they are purchasing pure saffron. Powdered saffron has the ability to be adulterated by other products, especially turmeric, which is of lower quality, and by the yellow stamen (male reproductive parts) of the same flower. The saffron crocus is thought to have originated in south west Asia or the Mediterranean region. It is a sterile flowering plant, i.e. it does not produce seed, and therefore its spread throughout the world has been dependent on human activity and the trade and transport of the corms. The finer details of the origins of the saffron crocus are somewhat disputed but generally it is believed that selections were made from the wild species, C. cartwrightianus, for unusually long stigmas and through this process, a sterile mutant form now known as C. sativus has emerged. Saffron is regarded as the world’s most valuable spice. About 15–20 flowers are needed to produce 100 milligrams of saffron filaments, which, if high quality, is the quantity required to colour and flavour a dish for 4–8 people. The production of saffron in Australia is a small but growing industry. 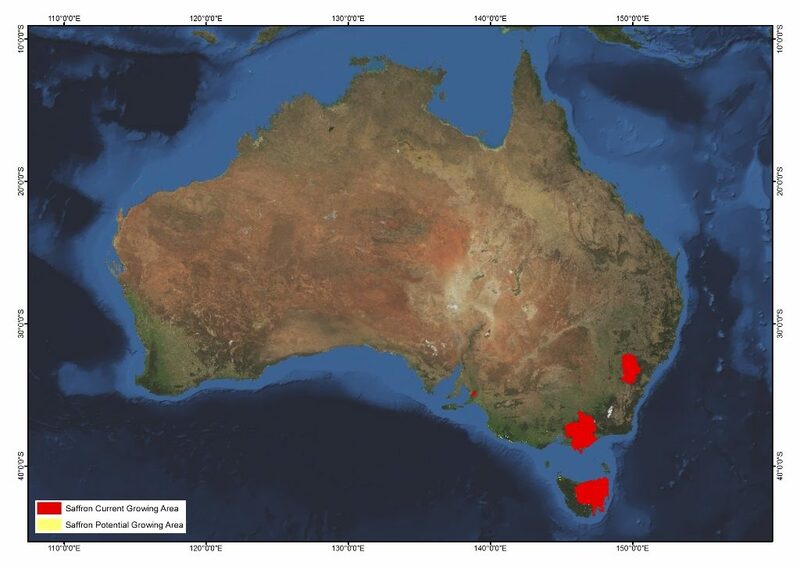 As at 2012, ABARE and ABS statistics indicated that there were 80 saffron producers in Australia. 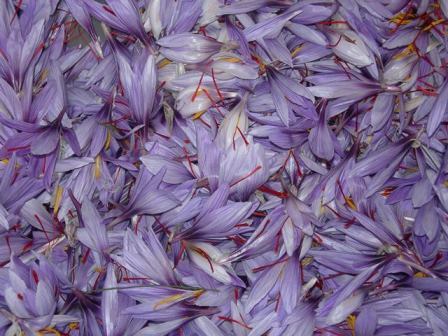 These growers produce about 10 kilograms of saffron at a gross value AU$300,000. Of these, approximately 60 growers belong to a network and supply their product under contract to a Tasmanian producer and processor. This company provides growers with corm material as well as crop management, harvesting and processing advice and market access. The remainder of producers sell their product at farmers markets or online. The area planted to saffron on most farms is small (less than 0.5 hectare) reflecting the laborious work of hand harvesting flowers at ground level and manual extraction of the stigma from the flowers. Saffron has been used as a flavour, aroma and dye, in many cultures for thousands of years. Saffron is a feature of European, North African and Asian cuisines, with each culture having dishes with saffron as a signature ingredient, e.g. bouillabaisse from France, paella from Spain, tajines from Morocco, and biryanis from south Asia. Saffron is also a key ingredient in breads and cakes in many countries. Due to its aroma (a mix of honey and hay) and its luminous yellow-orange colour, saffron is also used in cheeses, confectionery and liquor. Saffron has long been used as a traditional medicine. It is appreciated for its relaxant quality as a tea and its ability to settle an upset stomach, and throughout history has been used for many varied purposes, from treating respiratory, blood and eye disorders, to being used as an anti-depressant. In the 2000s, saffron received renewed worldwide interest for its medicinal properties. It is now subject to scientific research for its use in anti-cancer, anti-inflammatory, anti-depression and pro-memory/learning treatments. However, the cost of saffron spice is prohibitive to its use as a drug. Preliminary findings of Australian–Italian research are showing that patients suffering from age-related macular degeneration reported at least partial restoration of vision when given daily doses of 20 milligrams of saffron. There is also research investigating the role of saffron in the prevention and treatment for some types of cancer and for treatment of Alzheimer’s disease. Saffron is cultivated throughout the world — on all continents except Antarctica. Most of the world’s saffron is cultivated in a geographical zone from the Mediterranean in the west to the Kashmir region of India in the east. Iran and Spain account for more than 80% of world production. In Australia, saffron grows and produces well in the Mount Lofty Ranges of South Australia, the Yarra Valley of Victoria and the alpine valleys of north east Victoria, the western slopes of the Great Dividing Range in central New South Wales and throughout most of Tasmania, except the west and parts of the northwest. Saffron requires a friable, well-drained soil to maintain the health of corms through a wet winter. In low rainfall environments good water holding capacity is important. Although saffron grows well in a wide range of soil types and textures, it performs best on sites with sandy or loamy texture. Ideally, soil pH should be slightly acid to neutral. Soil fertility should not be too high; saffron has not performed well in red volcanic soils. A cool temperate climate is essential for saffron production. The natural climate for the saffron crocus is a Mediterranean climate, characterised by a cool-cold, wet winter and a hot, dry summer; an annual rainfall of 375–1,000mm per year; and intense solar radiation. 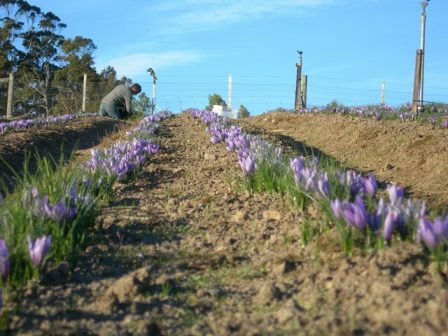 While the saffron crocus thrives in a Mediterranean climate, production is optimised when available moisture is between 800mm and 1,200mm, depending on the seasonal conditions. Irrigation may be required to supplement rainfall in spring to build up energy reserves of the corms, and again in autumn before flowering. Persistently humid conditions may harm corm health, especially during summer. Rainy or cold weather during flowering may induce disease and reduce yields. Saffron crocus requires cold to initiate flowering. Leading into flowering (end March-early April) a minimum temperature of 5°C is required and maximum temperatures should not be greater than 20–25°C. 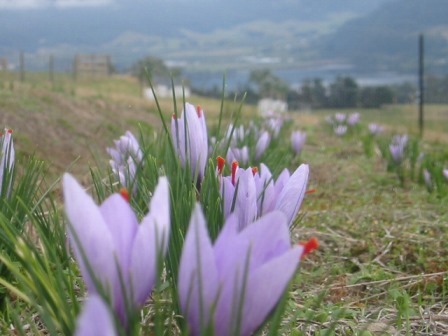 Saffron crocus thrives in cold winters and frosts (down to −10°C), and even short periods of snow cover. There are no registered varieties or cultivars of Crocus sativus. Commercial producers seek forms or types that have shown good productivity at desired locations. The saffron crocus does not produce viable seed, so the plant is propagated by the multiplication of the corms. There is little genetic variation in the plant, so it is important to purchase establishment stock from a reputable supplier. All day sun is required for saffron and this should be taken into account when selecting a site for saffron production. A comprehensive soil test of the proposed site is also important to understand the characteristics of the soil, especially soil pH, salinity and nutrient levels, as well as to ensure there are no residual pesticides in the soil that may affect corm health and growth. A saffron crop is established by planting corms in summer (the plant’s dormant period) into raised beds, which allow for good drainage and easier picking. Each corm lasts one season only and is replaced by 1–10 daughter corms. The new corms grow above and beside the old ones, so the corms get closer to the soil surface by 1–2cm each year. The crop needs to be lifted and replanted in a new area about every three to four years. Replanting is also recommended because yields begin to fall due to overcrowding and/or damage occurs to corms that are too close to the soil surface. 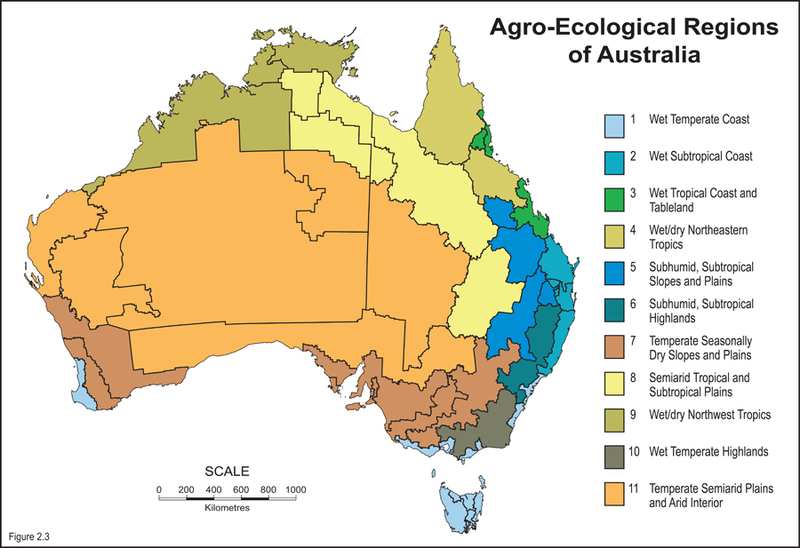 In Australia, the crop should receive about 800–1,200mm of water annually, through rainfall and/or irrigation. An irrigation supply is important if there is not sufficient rainfall during spring when the corms are maturing, or in autumn, just before flowering. Overseas experience shows that rain 10–15 days before flowering results in excellent flowering and high production, whereas under drought conditions, small flowers with small stigmas can be expected. 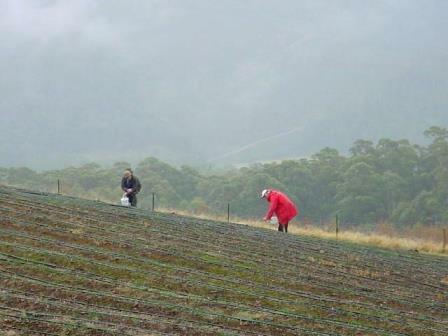 Management and processing practices for Australian grown saffron have been documented by the Tasmanian company but have not been published. Weeds can be controlled with herbicides during summer or autumn, before the new season’s growth of the crocus. During the growing season, mulch may help suppress weed growth between the plants. Vertebrate pests such as rabbits, birds and farm livestock have been known to lift and even eat crocus corms and fencing may be required to prevent animal access to the plants. Insects can be a pest as they will eat the saffron flowers, however, as the flowers are picked within hours of emerging, any damage is usually minimal. Globally, there are many pests and diseases that affect saffron, however, the incidence of these is heavily influenced by the growing environment. Warm, humid and moist conditions during spring and summer will encourage the development of problems such as nematodes, leaf rusts, and corm rot. The risk of fungal disease in corms may be minimised by treatments at the time of rotational replanting. A minimum area of about 2.5 hectares of land is required for commercial saffron production, enabling a rotation of the growing area every three to four years, and a build-up of corms over the growing periods in one plot. Without this rotation corms become overly susceptible to fungal disease. The site will need to be fenced to stop livestock and wildlife grazing and digging in the plot. The capacity to irrigate will be required in most situations to ensure the crop receives between 800-1,200mm of water each year and particularly during spring and shortly before flowering. Harvest involves manual picking of the flowers. Because of the variable height of the crocus flower across the field, a successful concept for a mechanical harvest has not yet been developed. 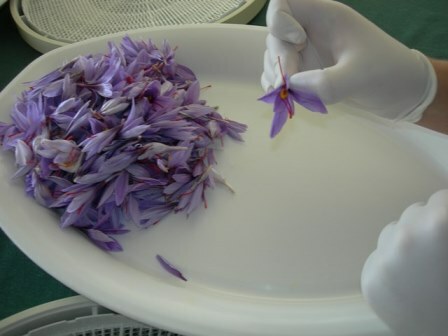 The extraction of the stigma from the harvested flowers can take place in any clean work area that is away from direct sunlight and meets standards for food preparation and pharmaceutical grade product — many saffron growers extract the stigma in their own kitchen. A kitchen-scale dehydrator is used to dry the stigmas. To avoid cross contamination with other products, especially residues from drying tomatoes, a designated dehydrator should be used for the saffron enterprise. Dried stigmas are stored in sealed glass jars in the dark until sale or packaging. Saffron flowers are produced in autumn, and in Australia this begins anytime from the last week of March to mid-April, and may extend into May. The crop will flower for 30–40 days, depending on the weather; with each plant typically producing two or more flowers over a 15-day period. There is usually a flush period of about 10 days, which accounts for about 80–90% of the harvest, although multiple flushes of a few days alternating with slow periods are not uncommon. The harvest of saffron is labour intensive, manual work, which starts early in the morning. On a 0.2 hectare plot (half an acre), there could be as many as 50,000 flowers to be picked each day during the flush, requiring a labour force of several people. The harvested flowers are returned to a kitchen or workshop where the stigmas are removed from the flowers (stripped) and then dried in kitchen-scale dehydrators to reduce the moisture content to below 12%. This is critical to prevent chemical degradation during storage. Research recommends adoption of a new drying method capable of producing spice with much greater aromatic character. However, this method had not been commercially adopted. Reports of saffron yield (dried spice) are highly variable, ranging from 0.2kg/ha to 4kg/ha, across the world. In Australia yields of 1-2kg/ha are usual. On average, about 150–200 flowers are needed to obtain one gram of dry stigmas. Australia’s importation of saffron is around 3,500kg, while domestic production was about 10kg. While the opportunity for import replacement appears massive, achieving sufficient scale, price competitiveness and the ability to service a customer base is very difficult. Globally, about 1,100 tonnes of saffron is traded each year but production is somewhat less, due to much saffron being purchased, blended and repackaged for on-selling. Iran is the world’s largest producer, accounting for around 90% of world production, and produces around 150 tonnes. Australian saffron is not competitive on the world market in terms of price, however it may be possible to market internationally on the basis of quality. The current level of domestic demand for Australian saffron is uncertain. As with considering any new enterprise, it is important to have a viable market identified before investing in and establishing an enterprise. Saffron is no different. Australian producers of saffron could look to sell harvested product to an existing processor or network; they could develop a cooperative or network with other growers to establish a critical mass to service retailers and wholesalers; or they could process and package their own product for online, farmers markets, and possibly retail sales. To compete against product from countries with low labour costs and to compete with adulterated product, Australian growers of saffron need to produce high quality saffron, on a consistent basis, to gain a competitive advantage. While this has generally been achieved to date, there is potential for even further improvement in the quality of Australian product in the near future. By far the greatest challenge for saffron producers is competing in a global market. Imported saffron is considerably cheaper than Australian saffron, mainly because of the very low labour costs in other saffron producing countries. Pure saffron (the stigma) competes against powdered product that is not pure (i.e. the product may include other flower parts such as the stamens) or product where saffron has been blended with a spice such as turmeric. Australian growers must therefore produce a premium grade spice and much success has already been gained in developing a reputation for this. The future adoption of the new recommended drying methodology has the potential to further mark Australian spice as being of demonstrably superior quality to imports. While the plant itself is relatively simple to grow, harvest and stripping (removing the stigma from the flower) is intensive work requiring attention to detail, patience and nimble fingers. However, growers usually find that these skills are quickly honed with practice making the efficient processing of many thousands of flowers a reasonable proposition during the few days of flower flushes. Weather can be a risk for saffron production, with unseasonal summer rain potentially affecting yield and corm health. Unseasonably warm or overly wet autumns can also reduce yield potential. When processing any raw product and value-adding, consideration should be given to food standards regulations, as administered by Food Standards Australia New Zealand and set out in Chapter 3 of its Food Standards Code. Information about farm and product certification can be found at, but is not limited to, the websites of Freshcare and HACCP. Retailers of saffron (from small shops to supermarkets) will have differing requirements for certification of product. The major processor of saffron in Australia has developed strict procedures for growing, picking and processing saffron for its network of growers, to ensure that its product meets Freshcare and SQF 2000 certification. The picking and processing procedures established ensure that product quality meets ISO (International Organisation for Standardisation) standards for pure saffron, in terms of colour, flavour and aroma. There is no industry body for saffron producers in Australia.